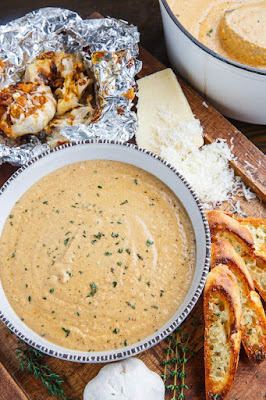 I have been enjoying a lot of soups lately and I just had to share this recipe for an asiago roasted garlic cauliflower soup. This is a super simple soup where you roast up the cauliflower and a few heads of garlic and make a soup with them along with plenty of melted asiago cheese! Other than the time that it takes to roast up the veggies this soup is easy to make and it requires very little hands on time. While the cauliflower is roasting or while the soup is simmering I like to make a crunchy popped quinoa and chia seed topping by toasting quinoa until it pops (like popcorn), along with panko bread crumbs, sesame seeds and chia seeds! The crunchy topping adds a really nice contrast in texture and I like to add lemon zest and parsley to the mix to brighten things up! A creamy roasted garlic cauliflower soup with plenty of asiago cheese and a crunchy popped quinoa and chia seed topping! Toss the cauliflower in the oil, salt and pepper and arrange in a single layer on a baking sheet. Cut the top 1/4 off the heads of garlic, drizzle the oil on top, wrap in foil and place on the baking sheet along with the cauliflower. Roast in a preheated 425F/220C oven until the cauliflower is tender and lightly golden brown to a little charred, about 20-30 minutes, mixing the cauliflower half way through. Heat the oil in a large sauce pan over medium-high heat, add the onion and cook until tender, about 3-5 minutes. Add the thyme and cook until fragrant, about a minute. Add the broth, roasted cauliflower and garlic, squeezed from the skins, bring to a boil, reduce the heat and simmer for 10 minutes before pureeing with a stick blender, in a blender or in a food processor. Mix in the miso and asiago and heat until the cheese melts into the soup, about a minute. Heat the quinoa in a pan over medium heat until the quinoa starts popping, and then slows down until there is more than a second between pops, mixing continuously to prevent burning. Mix in the breadcrumbs, seeds, asiago and toast for a minute or two. Mix in the lemon zest and parsley before serving as garnish on the soup. 0 Response to "Asiago Roasted Garlic Cauliflower Soup"